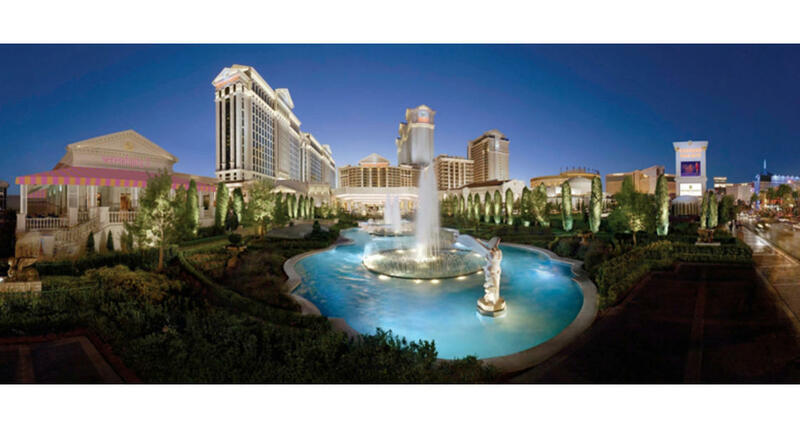 Celebrating the glory of Rome, Caesars Palace has been a must-see destination resort since it opened in 1966. Located in the heart of the Las Vegas Strip, those famous fountains, dramatic gabled pediments and Corinthian columns are world-renowned. A renaissance that began in 2000 has elevated its status even higher. The addition of the $95 million Colosseum brings superstar performers and lavish productions shows. Celebrity chef Bobby Flay joined Caesars with the opening of Ogden's namesake restaurant, and Flay's Mesa Grill, his first restaurant outside New York. The Forum Shops at Caesars added 60 new upscale retailers to an existing group of 100 shops during its recent expansion including Kate Spade, Juicy Couture, CH Carolina Herrera and Harry Winston. The addition of a five-acre, open-air Roman Plaza features the Italian trattoria Viale, which overlooks the Strip as well as an outdoor event amphitheatre. Elegant guest rooms and suites feature such standard amenities as marble-finished bathrooms, soaking tubs, in-room televised gaming instruction and high-speed Internet access. Deluxe suites include such lavish accoutrements as private dining rooms, wet bars, saunas, steam rooms, home-theater systems, putting greens and workout rooms. The penthouse suite, with butler, security and attendant services, are a sight only for the super elite. Inspired by Rome's famed Baths of Caracalla, the "Garden of the Gods" offers a refreshing break from the desert heat with several swimming pools surrounded by graceful fountains and classic statues. Relax in the private oasis of the Venus Pool, which offers guests 21 and over a serene escape from the traditional hectic pool experience. Two outdoor wedding chapels overlook the lush grounds. There's so much more to see: The Qua Baths & Salon will leave you invigorated; the trendy "COLOR - A Salon by Michael Boychuck" is THE place to prepare for a spectacular night out; 300,000-square-feet of premium meeting and convention space; and 129,000 square feet of gaming space, with the Palace, Forum and high-limit Palace Court casinos full of table games, high-tech slots and poker room.